As an alternative to separating eggs for this cake, you can purchase liquid egg whites at Eggology.com. Put the egg whites in the bowl of a stand mixer fitted with the whisk attachment and let them warm until they’re a little cooler than room temperature (about 60°F), about 1-1/2 hours. (To speed up this step, set the mixer bowl in a bowl of lukewarm water and stir the whites occasionally; check the temperature frequently. )Position a rack in the bottom third of the oven and heat the oven to 325°F. Have ready a 10-inch tube pan with removable bottom. Sift together the flour, 1/2 cup of the sugar, and the salt; set aside.Add the lemon juice to the egg whites and beat on medium-low speed until the mixture is quite frothy and has increased a little in volume, 1 to 2 minutes. Increase the speed to medium and slowly, about a tablespoon at a time, add the remaining 1 cup of sugar. Continue beating until the whites thicken and form soft droopy peaks when the beater is lifted, 6 to 7 minutes from when you began adding sugar. Do not beat the whites until stiff. In the final minute or so of beating, add the vanilla extract. The mixture should be voluminous and light but still fluid enough to pour.Sprinkle about one fifth of the flour and sugar mixture over the egg whites and with a large spatula, gently fold it in. Continue folding in the remaining flour-sugar mixture in 4 more additions until it’s fully incorporated. Gently pour the batter into the ungreased tube pan. Run a spatula once through the batter to eliminate any big air bubbles and then lightly smooth the batter if necessary. Bake until the top is a light golden color and the cake feels spongy and springs back when touched very lightly, 45 to 55 minutes. Meanwhile, toss the berries with the sugar and Grand Marnier (if using) and refrigerate for at least 1 hour before serving (you can prepare the berries up to 6 hours ahead).When the cake is done, insert the neck of a bottle or a funnel into the tube part of the pan and invert the pan. Let the cake cool completely before removing it from the pan. (Cooling the cake upside down keeps it from collapsing before it cools, and elevating it on a bottle or funnel helps air circulate for faster cooling. )To remove the cake, run a thin knife or spatula around it to loosen it. Lift the cake (still on the tube section) from the pan. Run the knife or spatula between the cake and the bottom of the pan. Invert the cake onto a cake plate and remove the tube section.Slice the cake with a serrated knife using a gentle sawing motion. 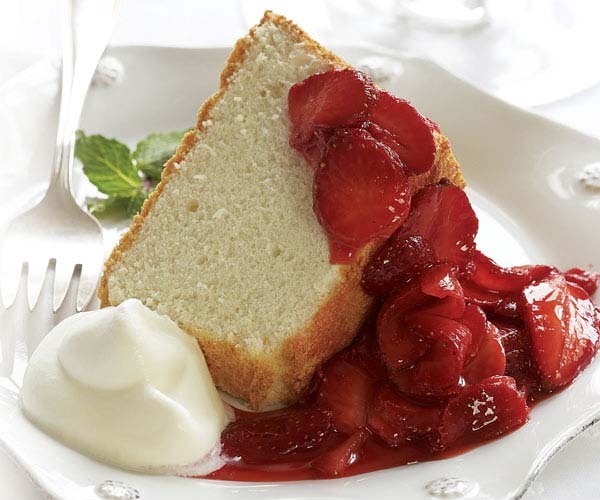 Serve topped with the strawberries and a dollop of whipped cream.